Yet another Symbian^1-running smartphone is paying us a short visit: the recently unveiled Nokia C5-03, which has just made it to the market. Let’s not make the little fella wait for us and start the unboxing. Oh, and we’ve got a short UI video demo for you too. Let’s get rid of that blue box and see what’s hiding in it. The phone sure seems cute – with that nicely curved back and edges. It is very compact and comfy to use. However, unlike many of the latest Nokia devices, the Nokia C5-03 is all made of rather cheap looking and feeling plastic. I guess, you get what you pay for. And the initial handset price is around 200 euro, which seems fair enough for the feature pack you get (a good enough 3.2” resistive touchscreen, an impressive set of connectivity options and a nice music player). Speaking of what you get, let’s get back to out unboxing. Along with the traditional paperwork in the tiny retail box we also found a wall charger, a one piece headset and a short but still useful microUSB-to-USB cable. And inside the phone itself there was a 2GB microSD card. 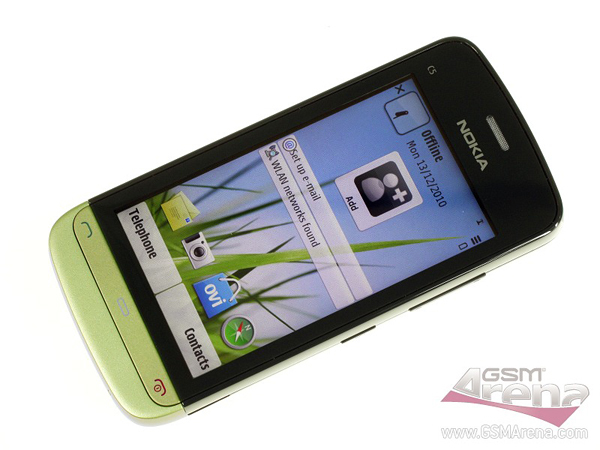 As for the device’s user interface, the Nokia C5-03 is based on the elderly S60 5th Edition platform (a.k.a. Symbian^1) and not on the more recent and more promising Symbian^3 OS, which powers the more expensive full touch Nokia smartphones (such as the N8, the C7 and the C6-01). So, here’s the unboxing video and a short tour of the user interface, enjoy. Those are our initial impressions of the Nokia C5-03 and there will be more when the complete review is ready so stay tuned.